Nintendo decided to leave 2017 with a bang, releasing the masterful Xenoblade Chronicles 2 in December in time for the holidays. The game is still generating interest as 2018 starts, and with good reason. Xenoblade Chronicles 2. Image copyright Nintendo. The Xenoblade 2 storyline is a common motif – hero symbiotically aligned with powerful weapon that bad people want. However, the beautiful graphics, voice acting, and gameplay details build out a game with stellar production values – taking the motif to its cutting edge. These stats are pretty good, so we can be sure that any glitches in the game are ACTUALLY in the game. We need to know, because the big fights in Xenoblade can get really intense. When you’re fighting bosses who name themselves “The Zekenator,” you want to be able to focus all of your attention on the game, not the tech around it. The true strength of Xenoblade is its ability to couch some really heavy philosophy into a lighthearted format. Make no mistake, however. The writers know how to switch from giggly humor to death and darkness on a dime. Part of the excitement of the game is that you never know when you will get your next emotion spike. No character is safe, a la The Sopranos. The main characters and bosses have excellent animation; however, faceless NPCs that show up in larger numbers seem to have been a secondary priority. This may have been a necessity because of the limitations of the Switch, because the game does not seem to run in full 1080p when the screen gets overly crowded during its bigger fights. The game’s world of Uraya runs the environmental gamut – you will explore valleys that resemble descriptions of the Garden of Eden before moving into frigid ice worlds and post-apocalyptic deserts. You may have a bit of trouble figuring out where to go in this massive world, because the map system is purposefully less helpful than the average strategy or exploration game. Older gamers may find this gameplay choice refreshing – you actually have to note details in the landscape to figure out some locations. One of the best gameplay elements is the weapons system. You should truly have a good time once you begin to expand the Blades that your character is able to carry. The combat system is perfect – simple to learn, difficult to master. You will need to cultivate near perfect timing for best results so that you can build up to intense, beautiful Overdrives (to use a Final Fantasy term). 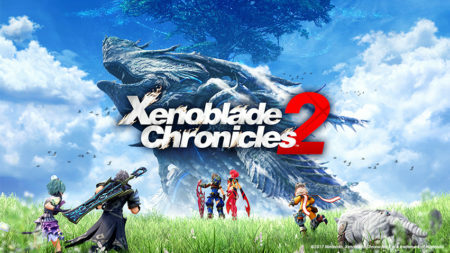 Even the best players should be able to get around 60 hours of gameplay out of Xenoblade Chronicles 2, which is almost unheard of in today’s hit-and-quit RPG/strategy games (are you listening, The Order 1886?) Xenoblade is truly a standout project. It may not hold your hand, but if you can get over that, you will find yourself immersed in a world of adventure and fun.